If these goals top your list, it’s important to find the best environmental consulting firm – one that can solve your environmental compliance objectives seamlessly and quickly. The key is to identify which company can deliver these desired results. Will you need Phase I and Phase II Environmental Site Assessments? A quality firm provides detailed assessments and reporting. Their due diligence process should satisfy the All Appropriate Inquiries in accordance with ASTM 1527-13 and qualify the property purchaser for protection under the “innocent landowner defense.” The firm’s comprehensive reporting should include on-site reconnaissance, personal interviews, and thorough research of the property’s historical information, past and current issues, and adjacent properties. ENVi Environmental prepares detailed and comprehensive assessments that are compliant with the ASTM 1527-13 as standard practice. Look for an environmental consulting firm that has both in-depth experience in the industry and relevant experience in the region. Local knowledge about the unique challenges and environmental conditions of Cleveland can provide invaluable insight. The firm’s proximity also allows them to offer in-person meetings and expedited services, to be there for you when you need them. ENVi Environmental brings more than 30 years of local experience to every project. Our reports are based on our comprehensive knowledge of the regulatory requirements in Cleveland. The best environmental consulting firms can partner with you from start to finish. Make sure the firm can do more than a Phase I ESA. It’s difficult to know exactly what services you will need in the early stages of a project. Look for a firm that is proficient in all areas of environmental concerns so they can offer seamless services. This will create a streamlined process that addresses all areas efficiently and cost-effectively. ENVi Seamless is ENVi Environmental’s suite of services that includes all environmentally-related offerings, from evaluation and assessment to abatement or remediation. Our ENVi 360™ Solution covers the full spectrum of services for your project. Research the firm’s track record of success. The best environmental consulting firms use proven testing and submission methods that result in a significant number of project approvals. If the firm can’t demonstrate that they are likely to get your project approved, look elsewhere for your environmental resource. This partnership is critical to your project’s future, so don’t settle for less than the best. 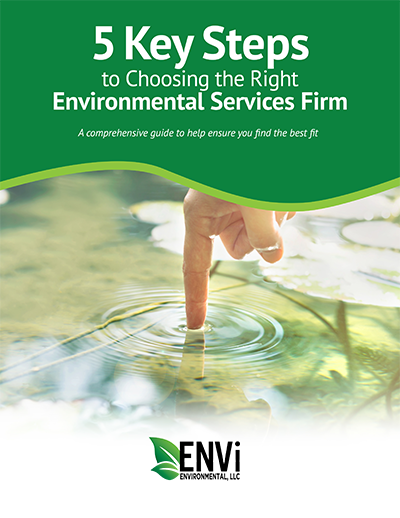 ENVi Environmental provides consistent, detailed methods that result in a high approval rate for the projects we submit to regulatory agencies. With our extensive experience working with regulatory agencies and our in-depth understanding of industry standards, we offer a near-perfect record of achieving successful approvals. To discover the best environmental consulting firms, it’s essential to examine more than cost. If you’re simply looking for a low-budget solution, you won’t get the precision methods and detailed reporting you need to avoid future issues. The old adage rings true: You get what you pay for. You may experience up-front savings, but these may not outweigh legal fees you face down the line. Look for a firm that offers top-quality services from highly qualified team members. If you end up paying a bit more for this expertise, it will be well worth it in the long term. ENVi Environmental personnel include professionals who are certified and specialize in erosion, sediment, soil, hazardous waste, asbestos, and OSHA training. Our clients enjoy full transparency, regular communications, and complete reports. With more than 30 years of experience, ENVi Environmental is the premier environmental consulting firm in Cleveland, OH. Our solutions cover the full spectrum of environmental services to meet the needs of complex projects from start to finish.